t*rexes and tiaras: Who loves Pepa Loves? I mentioned in a recent edition of Friday Favourites that I was loving Pepa Loves at the moment and that I'd placed an order, that day. Well, it arrived one week later, which I think is pretty good going. Want to see what I ordered? Well, here goes.. Yes, that's a pair of trousers. 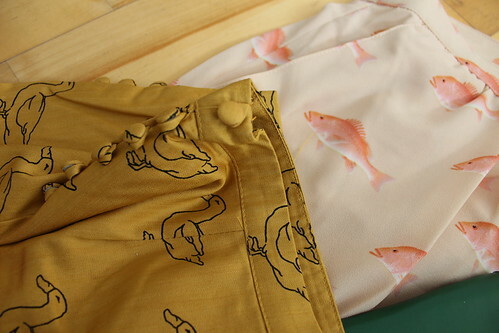 I have no idea what came over me, except that they are mustard (and I love mustard) and have a cute duck print, and I couldn't decide between the shorts, which I was worried might be too short, and these. I went for both. Annoyingly they're both a bit big, but I think I might be able to take them in a little. I don't know whether I'll be comfortable wearing them, as I'm never convinced that trousers suit my shape, but maybe I'll be brave. The attention to detail on the shorts really impressed me. They have a ruffled hem and also cute fabric-covered buttons to each side. I absolutely love them. I also went for a much more "me" answer to this co-ord trend which has been doing the rounds. 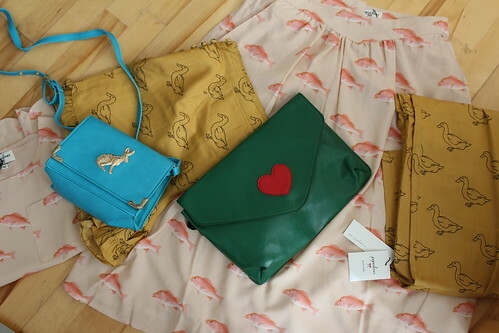 A cute, whoosy fish print skirt of a decent length, with an equally cute scalloped edge top in a matching fish print. I tried these on together and am not actually convinced about how much I'll wear them together, as the scallop detail kind of gets lost in the print of the skirt, but they're super cute and I'm pleased with them. 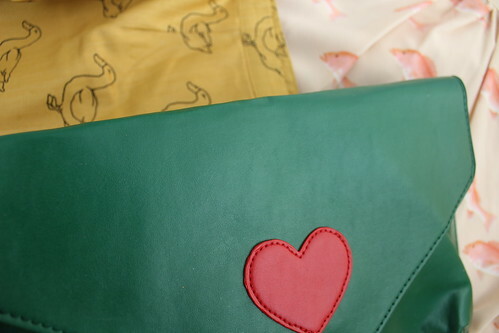 And the rabbit bag, which I saw last season and was smitten with it. I saw some similar ones on other sites, but nothing seemed to be as perfect as this one. And I'm pleased to say that I like it just as much in person. 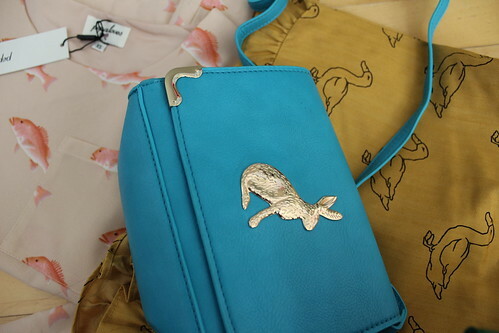 The blue colour is so bright and the rabbit charm to the front is lovely. It's quite small, but I'm fine with that - plenty big enough for all of the essentials. The green clutch was a complete impulse purchase. Reduced in the "less than €10 section, I added it because I like the contrast of the red heart against the deep bottle green, and I'm a sucker for bottle green. All in all, I'm impressed with the quality and delivery time of my order. I think the clothes are well-priced generally and there are some real bargains to be had in the sale. I may have screwed up with the size conversions a little, so some of the things are a little big, but that's mostly down to me not knowing what size I am and always being convinced I'm a lot bigger than I am. 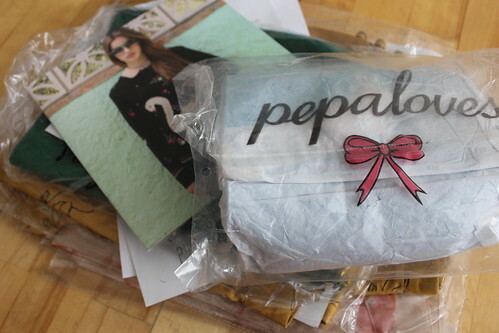 Have you shopped at Pepa Loves? Has anything taken your fancy? WOW!!! I am off to take a look at the site now. Thanks for sharing. I think I may be in love with the fish print. It's such a pretty print. 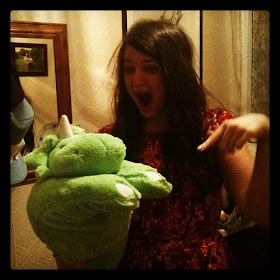 I think it might be mine as well..
Loving those fishies, shame they don't do bigger sizes. You decided against the eiffel tower dress? Yeah, I wasn't quite sure the shape of the dress would suit me. I might order again though, the parcel came with a voucher for the next purcahse! Oh,t hey have some pretty things! Such cute patterns on both of them Char. Loving the shorts, the detail is so pretty. 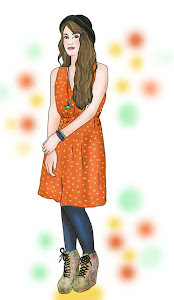 Me too - I'm thinking that I could wear them with tights and brogues so that I don't have to wait for next summer! I don't dare go and have a look at the website, I've spent far too much money recently as it is! Everything you've ordered looks fab! I can't wait to see the trousers. It's so pretty, though - just a little look wouldn't hurt..! Hehe, they're fab but I'm scared of trousers. It's such a cute little bag - I managed to fit everything I needed int here on Sat as well! I'll give them a try and see how I feel, but I think I'll have to wait for a more confident day. It took me ages to get really comfortable with trousers when I started wearing them last year after being a skirts/dresses girl. I kept thinking everyone was staring at me at first but now it is second nature for me to put on a pair of trousers - and they are soooo comfy! I've not worn them for years, but maybe I can make myself get used to them again.